Investigations have been recently carried by the Food Standards Agency after public concerns regarding food hygiene in some of our favourite restaurant chains. This investigation has impacted food businesses such as Wetherspoons, as well as schools and care homes up and down the country. It would be understandable if consumers started to lose the trust that they have in these businesses and the production companies that supply them — meaning that informative decisions must be made to set reassurance. For example, look at the horse meat scandal of 2013. From maintaining consumer confidence to upholding the quality of your products — security systems can play a big part. We also explore the crime surrounding the industry and how the implementation of protective systems can boost satisfaction. It goes without saying that we should all be looking to have ethical working practices across our food factories to ensure the safety of both workers and any animals that might be present, and this can be achieved by the technological advancements occurring in the security sector. Begin by implementing access control systems across your property. This will put an instant barrier between operations and any entry attempts by unauthorised personnel. Whether this a swiped identification card, biometrics or a passcode way of entry, only authorised personnel will be granted access. If you haven’t already, CCTV could potentially benefit your food factory. By spring 2018, all slaughterhouses within England are required to have CCTV systems in place that can be reviewed by the FSA who have unprecedented access to footage within a 90-day period — is this something we should be looking to do in food factories to ensure safety for British consumers? CCTV is a worthwhile investment for production companies who want to gain visibility of their entire operation. Not only that, it allows food factories to gain have greater visibility on their production; which of course will be beneficial to the consumer. What benefits do CCTV systems and cloud CCTV storage bring to food factories? Customer reassurance — as food factories don’t operate openly and everything is hidden away, this instantly creates suspicion from a consumer’s perspective as they will be the ones buying the final product once distributed to stores around the country. CCTV will counter this issue as it shows that operation centres have nothing to hide — giving them the ability to publish any footage if accused of misconduct. Maintaining quality — using more advanced CCTV within food factories will enable production companies to monitor the production line and maintain the standards that they sell themselves on. Sometimes, a human error is unavoidable on a production line after several hours of non-stop work — being able to detect it instantly is essential. CCTV can prevent crime — it’s been proven. By installing these systems, food factories can protect themselves from threats that are external and internal as well as being able to support themselves in any claims of violation. Protecting goods is a main priority for food factories, but fraud is something that they should be looking at. 89 percent of manufacturers on a global scale were impacted by fraud in 2015 — 2017 saw a 7 percent rise on this result. When it comes to the most common types of fraud, information theft stood at 30 percent, compliance breach at 30 percent and intellectual property theft standing at 26 percent of the respondents who were asked — all of which could cause great impacts to production lines. Junior employees were also the most common perpetrators to commit fraud within a manufacturing factory — at 39 percent. Temporary manufacturing workers came in at second place with 37 percent, while those in senior or middle management positions were at 33 percent — the same as ex-staff members. However, vendors/suppliers who do not have as much access to your business accounted for 33 percent too. This clarifies that anyone has the potential to commit a crime within a factory. 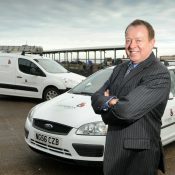 Peter Houlis is Managing Director of 2020 Vision, a security specialist, implementing and supporting leading-edge IP-enabled security technology; video surveillance, access control and converged security solutions to protect assets, increase situational awareness and deliver business intelligence.